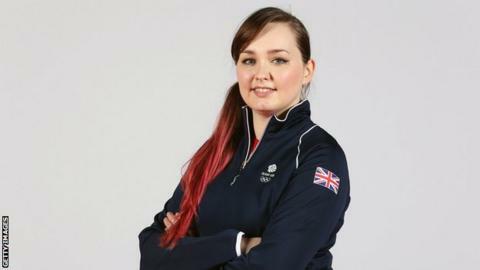 Shooter Jen McIntosh believes competing at the Rio Olympics "will be a walk in the park" having faced the pressure of a home Olympics. The Scot, 24, all but sealed her place at next year's Games after finishing fourth in the 50m rifle three positions at the European Championship. "A home Olympics was far scarier than an Olympics abroad," she said referencing her London 2012 experience. "If I can qualify for the final round, I'll be really happy." McIntosh's fourth place in Slovenia secured British Shooting a quota place for Rio and she is expected to be given that spot. "I had to ensure I was placed high enough up in this event to get the quota place for my country," she explained. "I've had a couple of events this year where I've just missed out by one or two placings, so it was quite a relief to finally get it in the end. "Although I've won the quota place for my country, it doesn't necessarily mean they'll send me. It's not guaranteed." But she added that she is "in a strong position to be selected". Great Britain have not had a female rifle shooter in a non-home Olympics since the 1980s. And, although McIntosh has won five Commonwealth Games medals, she admits Rio would be a "big step - worlds apart". "There's been some changes to the scoring system. Scores are now not carried over in to the final, so that makes it a bit easier to get a medal if you can get to the final," she said. "I just need to keep doing what I'm doing. I'm in really good form at the moment, so it should be comfortable that I get in to the team." Much like the qualification process, travelling around the world is not easy for McIntosh, with the Scot saying getting a gun on a plane "has its challenges". "It can be difficult - there's a lot of paperwork at customs and check-in is a handful, but you do what you do for your sport," she added.